Building your own high performance intercooler assembly? Need a high quality, Air to Air or Liquid to Air core? Need it tomorrow? No problem. Bell Intercoolers offers a large selection of high performance, pressure tested intercooler cores in sizes to meet all of your turbo/supercharger performance requirements. 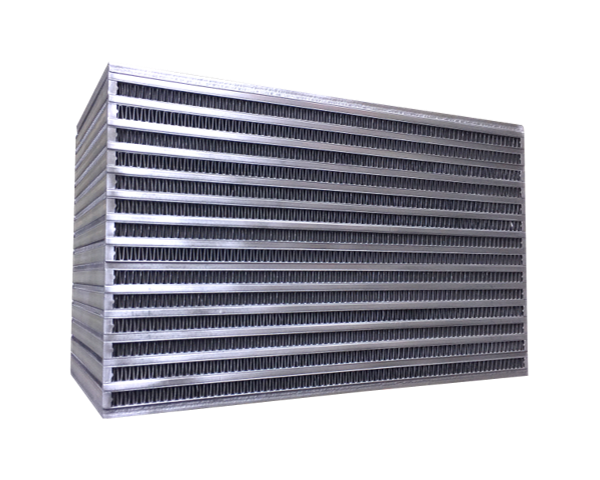 All of our intercooler cores are made in the USA using controlled atmosphere vacuum brazing, and utilize a highly efficient and extremely durable bar and plate design that provides large surface areas for superior levels of heat dispersion. They are rugged, robust, very resistant to external damage and able to withstand extreme pressures under the most demanding operating environments. If your goal is to produce maximum power in a turbocharged application, then you need the coolest air temperatures possible. Cooler air is more dense, and dense air produces more power at the same boost pressure. 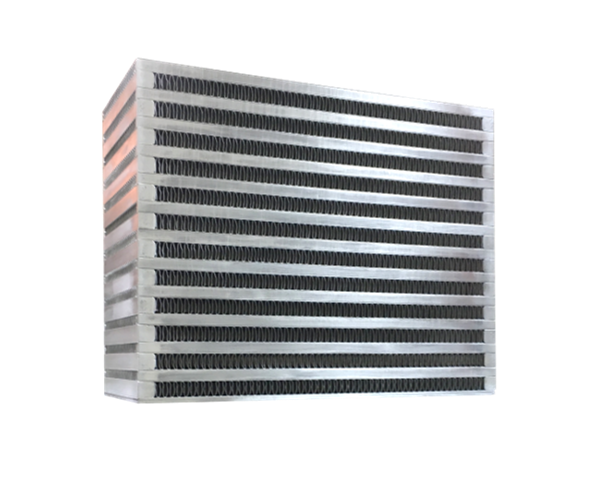 Drawing on decades of experience in core development and testing, Bell Intercoolers cores have been carefully designed to deliver superior heat dispersion of the charge airflow while minimizing the amount of pressure loss. Over the years, thousands of satisfied customers have relied on Bell Intercoolers cores to build some of the the most power producing turbocharged applications around the world. If you are looking for exceptional performance from your turbocharged engine, consider adding a Bell Intercoolers bar and plate core. Our cores are the heart of every heat exchanger system we produce, and with over 3,000 core sizes and configurations in stock, we probably have yours on hand and ready to ship. Why Choose a Bell Intercoolers Bar and Plate Core? Not all cores are created equal. You will not find another core that offers a better combination of performance, durability and flow than that of a Bell Intercoolers core. It is this combination that has allowed Bell Intercoolers cores to remain the top choice among elite racing teams, performance shops, discerning motorsports enthusiast and demanding OEMs. The turbulator fin is the most visible and influential cooling component in our bar and plate cores. Bell Intercoolers fins are uniformly and fully brazed to the entire tube surface resulting in strongly sealed and leak-proof cores. Our cores are offered in 3 distinctive designs, each with a unique fin and construction design, suited for different applications and performance needs. You will not find more core thicknesses, sizes and fin style combinations anywhere else. Most times you will find that the perfect size core for your application is in stock and immediately availability. Order before 1:00 PM central time and if in stock, we will ship your core that day. With over 3,000 core sizes available, we probably have what you need on hand.